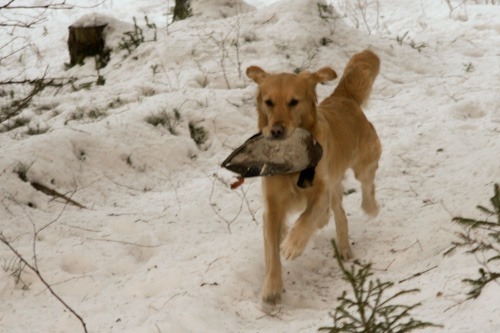 I claim that one can pass a novice cold game trial in Sweden through working on deliveries, steadiness and heeling (providing, naturally, that the dog is interested in hunting and will pick up game). I constantly go back to those basics, both in my own training and when giving classes. If we don’t train for a proper foundation, we’ll suffer for it forever. I’ve also seen quite a few teams – well on their way, already placing in trials – that through going back and working on these foundation skills, have been able to solve problems at a distance and seemed to make the dogs think ”Aha! So that’s what you meant!”. And all of a sudden the hunting is perfect; the dog comes straight back without switching the game or looking at the person throwing the game. Naturally we gradually need to work on more skills: the stop whistle, holding an area, casting, etc., but even while doing so, it’s important to keep rewarding the dog for the foundation skills. Deliveries: Reward the dog when it delivers the object/game. Perhaps not every single time, but often enough for the dog to know that it’s really worthwhile to come back to you. Sometimes you might use treats, sometimes play, sometimes you’ll send your dog on a second marked retrieve, and so on. If you see your dog making a difficult choice en route to you – perhaps ignoring a distraction, passing another dummy without switching, or coming straight back even though a person out picking berries turned up midway – make sure to be extra generous when rewarding. Heeling: Work on your heeling into and between each exercise, making it a natural part of the whole thing. First you heel nicely, and then you get to work. Don’t let your dog continue on to work if it for example moves ahead of you or if it’s not paying attention while heeling. Steadiness: When the dogs have learnt how much fun work is, one of the most difficult things we can ask of them is to just sit still and watch, particularly while other dogs are working. Reward your dog for doing so, both from your hand and by letting it work after showing such great restraint. Diesel and I went on a duck hunt a couple of years ago – and do you know? The basic skills were the important ones there too! I really got to see all of our training paying off there and then. Deliveries: It was the first time for her with warm game, but she brought it straight to me – if you have something in your mouth, you should bring it. Steadiness: There weren’t a great many birds actually shot, but on the last drive they basically just rained from the heavens. I had her on leash a fair bit, but she was off leash too. I kept my focus on her sitting down and her feeling steady before I sent her. Heeling: If she enjoys retrieving at other times, warm game made it even more fun. I paid close attention to her heeling form before casting her whenever we moved around. I also rewarded her often when the heeling was difficult, for example when we needed to move to a spot where we had seen ducks fall and then cast the dogs, one at a time. I chose to reward her for both the heeling and steadiness by my side while the other dogs were working. Casting gets more and more important the higher up in the trial structure you get and the skill is also vital on a hunt. The fact that we had been working on blind retrieves and straight lines, and that we have a good stop whistle, was very apparent. But we need to work more on casting to the left and right. When I saw that it wasn’t working, I refrained from casting her to the left or right from a distance (since I knew we would fail), but if I could move in closer and knew that she knew that there was something to her left or right, I (when suitable, without disturbing anyone else) could cast her at that point instead. In conclusion I’d just like to say: Back to basics! Never ever forget the foundation skills, but also remember to challenge your dog and yourself in your training.